Lights… Camera… Action! If you’ve ever dreamed of directing a commercial, now’s your chance. We need your help to film fun, creative commercials featuring our IDLife products.Want to get started? All you have to do is film your idea with your family and friends. Then, post your 30 second to 1 minute video to Facebook using the hashtag #IDLifeSpotlight.The five best IDLife commercials will premiere at Revolution 2019, where everyone will have a chance to vote on their favorite one. The winner will receive a grand prize of $1000. The top three videos will be professionally recreated and shared with the IDLife community on social media. 2. Your commercial must feature at least one IDLife product. 3. Videos must be posted to Facebook by February 15th, 2019 to be considered. Make sure your video is set to a public setting so we can see it! Remember, if you’re in doubt, you can always call our Customer Advocate team to double check. 5. Use the hashtag #IDLifeSpotlight when you post your video on Facebook to be officially submitted into the contest. Again – be sure that your video is set to public. 6. 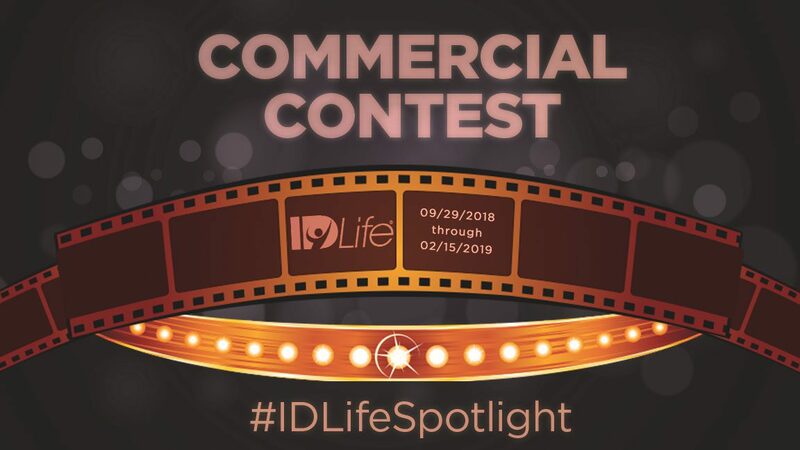 IDLife Corporate will choose the top 5 commercials and air them at Revolution 2019. 7. The top 3 commercials will be professionally recreated by IDLife (if needed). 8. The winners will be announced at Revolution and paid $500 for 3rd place, $750 for 2nd place, & $1000 for 1st place. OK, it’s time to make some IDLife movie magic. We’ll see you on the red carpet!